A new shop & New Owners, coming soon! Welcome to the new Dive On It Scuba web page. You were probably looking for the old DiveOnIt Scuba Supply page. As most folks know, the shop itself has been closed since November. However as of March 2017, DiveOnIt, under the ownership of Matthew & Jerika Verrier has ceased to be a going concern. While Matthew and Jerika had hoped to reopen this spring, they decided it was in their best interest to close permanently. That being said, a couple of folks who had worked with DiveOnIt over the past few years didn't want the dive community in Northern Rhode Island and South East Massachusetts lose out on a convenient and helpful dive shop and training facility. 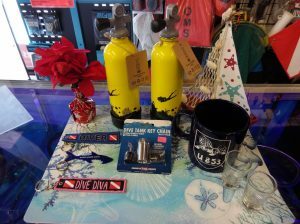 An arrangement was made by ScubaTrainors, LLC with DiveOnIt's landlord to take over the retail space and also with the former shop owners Matthew and Jerika to utilize the DiveOnIt name & PADI affiliation. Right now we're working on acquiring inventory, rental gear & equipment to have the new shop open by April 1st. Keep an eye on this page for more details and we hope you'll come check us out when we open the doors once again!